In So You Want to Sing Jazz, singer and professor of voice Jan Shapiro gives a guided tour through the art and science of the jazz vocal style. Throughout, Shapiro hones in on what makes jazz singing distinctive, suggesting along the way how other types of singers can make use of jazz. and melodic embellishment and improvisation. 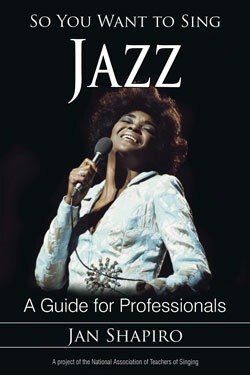 So You Want to Sing Jazz is the third volume in the So You Want to Sing: A Guide for Professionals series of works devoted to providing a complete survey of what it means to sing within a particular genre. Each contribution functions as a touchstone work for not only professional singers, but students and teachers of singing as well. Titles in the series offer a common set of topics so readers can navigate easily the various genres addressed in each volume. The So You Want to Sing series is produced under the direction of the National Association of Teachers of Singing, the leading professional organization devoted to the science and art of singing.